SoftBiopsy® is a tissue collection, storage, and transport device system that is used to biopsy the exocervix and lower genital tract during colposcopy or when a suspicious lesion is detected. Unlike the “sharp edge” biopsy design of gynecological biopsy devices, the SoftBiopsy® design is intended to gently and non-surgically frictionally abrade, collect, and store into the patented KYLON® fabric abundant trans-epithelial tissue samples for transport to the lab. The tip device containing the sample can be snapped free from the handle, placed in the fixative vial, and transported to the lab. In the lab, the tissue can be easily and efficiently removed from the fabric-trap container for processing. The removed tissue is identical to the conventional lower genital tract biopsy or curettage tissue sample. Soft-ECC® is a fabric based tissue collection, storage, and transport device system (both an endocervical curette and an innovative tissue-trap fabric container) can be used to biopsy the endocervical canal during colposcopy or the evaluation of abnormal uterine bleeding. Unlike the conventional sharp endocervical curette, the Soft-ECC® is intended to gently frictionally abrade, collect, and store (for transport to the lab) abundant trans-epithelial tissue samples into the patented KYLON® fabric. The tip device containing the sample can be placed in the fixative vial and transported to the lab. In the lab, the tissue can be easily and efficiently removed from the curette fabric tissue trap container for processing that is identical to the conventional endocervical curettage tissue sample. Soft-ECC®-S is a tapered, nylon hooked fabric tipped acrylic biopsy tissue collection, storage and transfer device system. 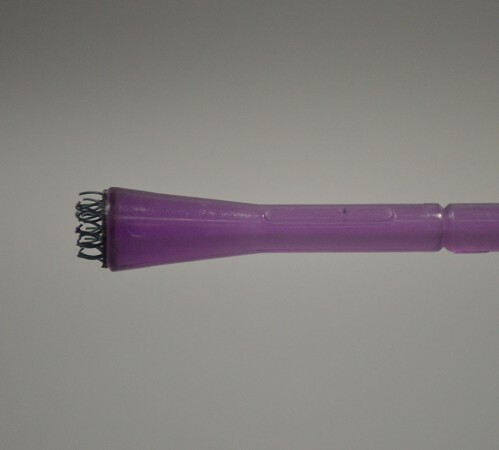 It is intended to be gently inserted into any size endocervical canal. This sampler contains a corresponding smaller pad size than other devices. It should be applied in cases where the cervical os is small, stenotic, or shallow, and used to obtain an endocervical biopsy / curettage when indicated. The fabric tip is completely inserted into the canal and not into the uterine cavity, pressed against the endocervical canal, and then rotated 3 complete revolutions clockwise, then 3 complete revolutions counterclockwise, and removed. The tip is then snapped apart from the handle at the fracture line, containing the trapped tissue specimen and placed in a pathological fixative vial. The vial with the sample is processed at the Pathology lab in similar fashion to the conventional endocervical curettage specimen, with the exception that the fabric container must be completely emptied using the standard operating procedure which is available upon request. The SpiraBrush CX® biopsy device is a disposable single use cervical biopsy instrument. 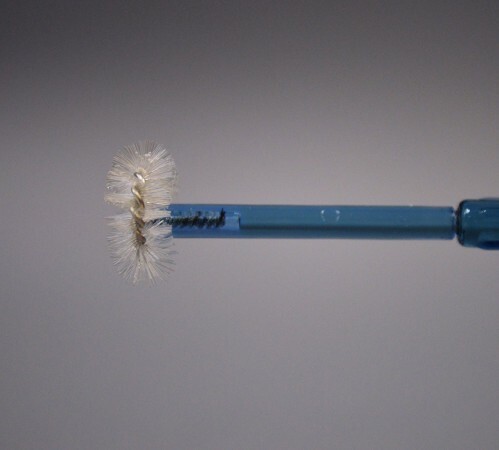 The SpriaBrush CX® consists of a uniquely shaped brush head designed to remove the squamous epithelial layer of the cervix with minimal trauma. 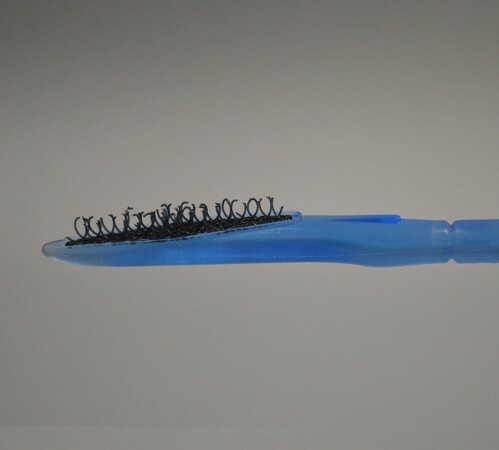 The brush head has a twisted wire spine holding semi-rigid double-layered nylon bristles. The brush head has been bent at a 90-degree angle to the 7-inch scored handle. 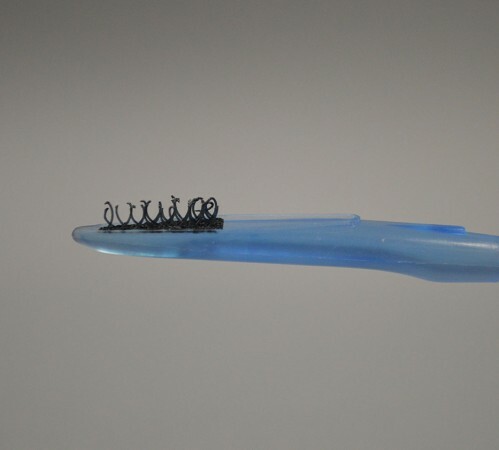 The brush is coiled into a spiral shape, allowing for the circular “face” of the SpiraBrush CX® to be applied directly to an abnormality that is seen on the ectocervix.